BRUSSELS — The European Union has unveiled a new batch of projects under its fledgling Permanent Structured Cooperation (PESCO) defense pact. There will be 17 new projects in addition to the initial 17 agreed almost a year ago. The new activities cover areas such as training, capability development and operational readiness on land, at sea and in the air, as well as cyber-defense. PESCO enables EU member states to cooperate more closely in the area of security and defense. It allows willing and able member states to jointly develop capabilities, invest in shared projects and enhance the operational readiness of their armed forces. The Cyber Threats and Incident Response Information Sharing Platform, one of the 17 new projects formally announced on Monday, will develop more active cyber-defense measures, potentially moving from traditional firewalls to more active measures. Top NATO officer hits back at European Union army concept endorsed by French President Emmanuel Macron and German Chancellor Angela Merkel. Another of the projects will develop and build a prototype European armored infantry fighting vehicle. The envisioned vehicle class aims to provide everything from combat and reconnaissance support to logistics, command and control, and medical support. The objective of the European Attack Helicopters project is to “significantly improve the TIGER global efficiency through a consistent upgrade of its detection, aggression and communication capabilities,” an EU fact sheet on the new initiatives states. Meanwhile, the Military Mobility package is designed to support member states’ commitments to simplify and standardize cross-border military transport procedures. According to a source at the European Defence Agency, based in Brussels, it aims to enhance the speed of movement of military forces across Europe. Bottlenecks exist that would impede the rapid shipment of combat gear around the continent in case of a crisis, officials warn. Another new project is the Deployable Military Disaster Relief Capability Package. It seeks to deliver a multinational specialist military package for assistance to EU and other states. Elsewhere, the European Union Training Mission Competence Centre (EU TMCC) aims to improve the availability, interoperability, specific skills and professionalism of training personnel for EU training missions across participating member states. The newly announced projects also cover cyber security, and the European Secure Software Defined Radio initiative aims to develop common technologies for European military radios. Specifically, the adoption of new technology standards is meant to guarantee the interoperability of EU forces during joint operations. The new projects also reach out to space, with the Radio Navigation Solution (EURAS) project seeking to promote development of EU military PNT (positioning, navigation and timing) capabilities and future cooperation taking advantage of Galileo assets. 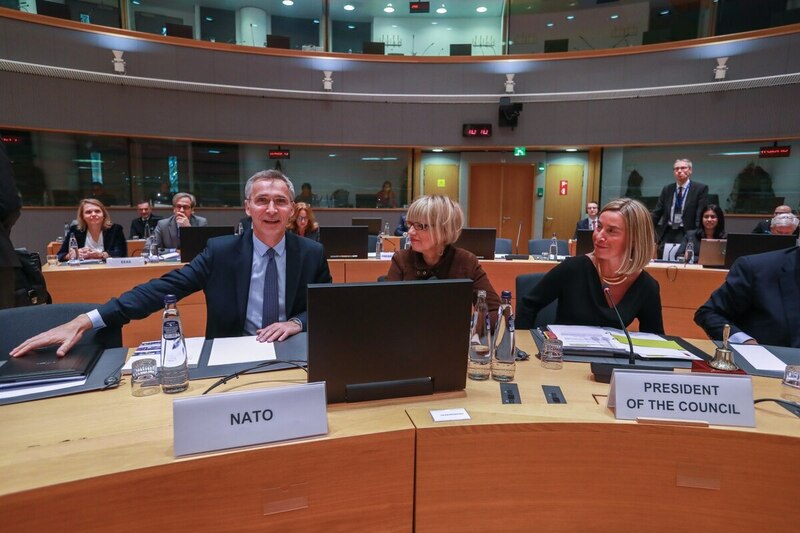 Speaking at a meeting of EU defense ministers in Brussels on Tuesday, NATO Secretary General Jens Stoltenberg welcomed the new batch of projects, saying they will make a valuable contribution to European defense. “I have welcomed EU efforts on defense many times, because I believe that projects such as military mobility, European Defence Fund, PESCO, all of that can contribute to fairer burden-sharing within NATO. It can complement NATO and it can also help to develop new NATO capabilities and also address the fragmentation of the European defense market. So this is something I have welcomed many many, times,” he told reporters. All weapons eventually developed through PESCO will be owned by individual EU countries.